However, prior to the team’s exhibition finale, they actually placed among the bottom third of the league in both categories, even after filtering out their snail’s pace (92.66) meeting with the Detroit Pistons when Nate McMillan opted to rest his top six players. Further investigation initially seemed to suggest that conditioning might be the culprit. Indiana has been the league’s tenth fastest team during the first and third quarters, but they’re currently the slowest in the second frame and near to it in the fourth. There’s a similar quarter-by-quarter pattern when it comes to forced turnovers. Here, the line of thought is that the Pacers are more active at the start of the game and after getting an extended break at halftime. But, there’s another layer to all of this. 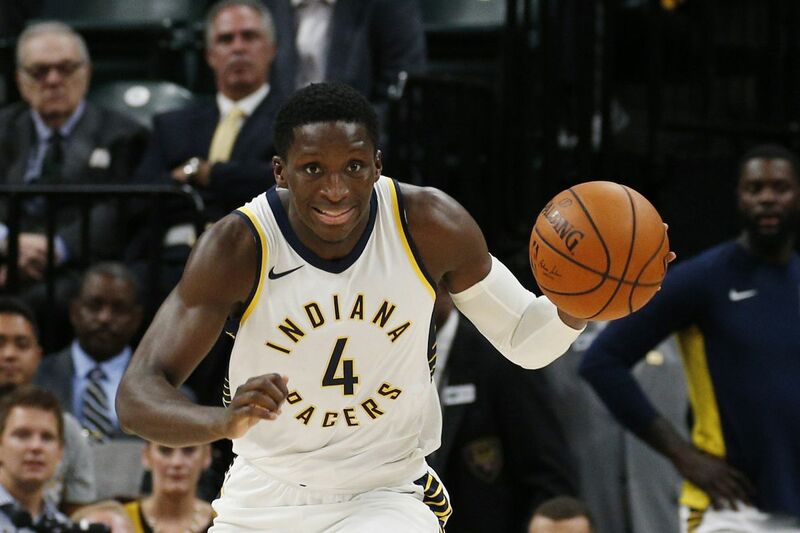 Victor Oladipo’s shot selection has been somewhat questionable, but he and Thaddeus Young have demonstrated a shared knack for playing passing lanes and advancing the ball quickly up the floor, as was evidenced by the pair racking up five combined steals in the first twelve minutes against Maccabi Haifa. Here’s the rub, though: Neither of them logged a single minute during any of the four preseason fourth quarters, and they only appeared in the second frames once. As such, even without the benefit of advanced on/off data, it’s obvious that their presence is a huge determining factor in how many possessions the team racks up per 48 minutes. On the flip side, however, the team seems to loosely be developing an inverse relationship between pace and rebounding rate, particularly during the first half. This, in part, may be because Domantis Sabonis, who has earned the majority of his minutes during the second quarter, has appeared far less averse to physicality while boxing out than Myles Turner. By comparison, Sabonis is posting a significantly higher defensive rebounding rate (36.5%) than Turner (16.4%). Also at issue, though, is that making a concerted effort to scramble on defense and outlet the ball to wings leaking out in transition lends itself to giving opponents multiple looks at the basket when fewer players are in position to crash the glass. Tellingly, only five teams in the league surrendered more second chance points per 100 possessions during exhibition play than the Pacers (12.3). If that continues to be an issue, playing effectively with pace for longer bursts will predominantly rest upon the energy capacities of Oladipo and Young to force turnovers at a comparable rate over increased minute loads. Otherwise, things could get dicey or, worse, stagnant.